The PADI Rescue Diver course is a favorite for many divers, and serves as a juncture before many divers go on to become dive professionals. In this course you will learn about prevention and anticipation as key to stopping most accidents before they actually occur, self rescue techniques, dealing with panicked divers at the surface, emergency management, and in water rescues and egression. Our staff at Splash Dive Center are comprised of experienced PADI Instructors, who are part of the local emergency response team in Placencia, Southern Belize and will ensure you receive thorough training. 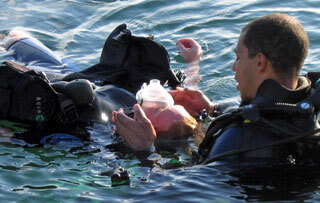 This course will really improve your confidence and make you a more competent diver. Family, friends and other divers will always feel more assured knowing they are diving with a PADI Rescue Diver. Please contact us for specific information and with the PADI E-learning option, it is also possible for participants in this course to complete the reading portion and knowledge review prior to arriving in Belize, so they get their most from their vacation in Placencia and can enjoy more time in their resort or at the beach with family and friends. This course is a prerequisite to the PADI Master Scuba Diver certification and/or the PADI Divemaster course and at Splash Dive Center we conduct our rescue classes over 3 days, and the course comprises of 4 academic class sessions, supported by independent study, and 10 in water training exorcizes which are evaluated with 2 scenarios on the final day of training. Our staff at Splash Dive Center will give you serious fun on the PADI Rescue Diver course in Placencia, both in and out of the water!